I was recently having a discussion with a fellow Karaite regarding the various stages of Karaite thought. In brief, he summarized that there were (in his estimation, as well as others) three main periods of Karaite halakhic literature: (i) early; (ii) late; and (iii) very late. Today, I am going to use the example of women and techellet and demonstrate how each of these periods approached this issue. In my opinion, we can trace the decline of the Karaite movement by looking at the methods these sages employed in explaining our religious conclusions, regardless of whether we agree with the ultimate conclusion itself. At the end, you get to vote who got it right. (i) Early Karaite Sages: These Sages (up till the 13th Century) were willing to engage meaningfully with the text and were willing to reach conclusions that differ from our Rabbanite brethren. (ii) Late Karaite Sages: These Sages (13th Century up through the 15th century) were willing to engage meaningfully with the text but were not as willing to reach conclusions that differ from our Rabbanite brethren. (iii) Very Late Karaite Sages: These Sages (16th-20th Century) were mostly summarizing the Karaite practices of their day. Let’s see how this plays out with respect to women and blue fringes. As far as I can tell, the majority of Early Karaite Sages held that women were obligated to wear blue fringes to the same extent as men. In fact, I do not know any Early Karaite Sages that held that women were *not* obligated. [1.] But their precise ruling is not important, let’s look at their reasoning. 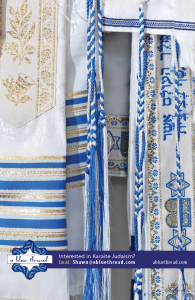 The tying of tzitzit [applies also to women], for daughters of Israel are also included in ‘Bene Yisrael’; both are equal in the command of Tzitzit. The words of the commandment are: Speak to Bene Yisrael and say to them that they should make tzitzit for themselves. The holiness of the commandment is also [for women], because women are included in fulfilling all the commandments as it is written, and you shall see it and remember all Hashem’s commandments and do them in accordance with your Rock’s instruction (Eshkol Hakofer 13 Letter Kuf). Regardless of whether I (or any Karaite agrees with their reasoning), they are at least engaging in the same types of analysis as the earlier stages. The following is an excerpt from Royal Attire: On Karaite and Rabbanite Beliefs. To be fair, he is not writing a halakhic work, but rather an explanatory work, so of course he is not going into detail on all these issues. But it is striking that he believes we know that women are excluded from the commandment based on tradition and not based on any textual source. Of course, in order to prove that the later Karaite sages were simply documenting existing practices, I would need to provide many more sources. I have read excerpts from the Egyptian Karaite sources of the 19th and 20th Century. This “explanation” theory holds for most of those sources as well. The Daughters of Israel are also included in ‘Bene Yisrael’; both are equal in the command of Tzitzit. Until more Karaite referenced works are available on this subject, I will seek written answers from the Tanach as instruction. I wear Tzitzit with a Thread of Blue as my tactile and visual reminder of YHVH. I am also afforded the opportunity and blessing to explain and teach others who see them, what they are and why they are so important. Right or Wrong. One or the Other. No multiple choices made available here to select. All 3 historical period interpretations are just that. Interpretations by Sages. I chose the clearest interpretation from the Earliest Sages. For as time has progressed to today, we as a society have become more inclined to accept “tradition” as a factor in our allowances of interpretations. Has Pashat for a Karaite changed? Pashat for a Karaite is to seek out the plain meaning with study and prayer for thyself. Based on Tanakh text. No extraneous “traditional” or more progressive modern practices. So my query to myself is, is it even possible to accomplish that in our English translations of Tanakh? Multiple choices here: perhaps, yes you can, no. But the question is actually this: when you use that English translation of a Hebrew Text, is the translated instruction and commandment then right or wrong from its original written intent? How skewed off is it from the original? a jot, a tittle? a mote? Perhaps what we should be looking for here, is a definition of what is the boundary and limits of acceptable Karaite “PLAIN” meaning, and if the current English translation renditions of Tanakh is indeed acceptable for commandment instructions for Karaite acceptance standards by the The Karaite Jews of America? I will be held accountable by my Creator for the use of the source of my studies and observations and practices. Thanks..I am woman and wearing tzit tzit…. all my karaite jewish female friends are using tzit tzit. Thanks..I am a woman and wearing tzit tzit…. all my karaite jewish female friends are using tzit tzit. Whoever wears tzizit, should have the tzizit visible, that is, wear them outside your clothes, don’t tuck them in otherwise it defeats the purpose. Please don’t think it has to be a four cornered garment. It’s clear that it means the left and right, front and back. If one argues they must be on a garment of *at least four corners* based upon a synthesis of sorts between the two passages that allude to them in the Torah, I cannot brand it a wrong understanding since this is a legitimate reading and I happen to know of two individuals who actually subscribe to it. But arguing that they are required on a three cornered is plainly erroneous. And contrary to what you contend, that is not “clear”; the Torah does NOT demand to have the corners spread out to all of those four directions, nor is there a logical inference (“Hayqesh”) to be made for doing so. Let’s see if we can break it down. First, what is the purpose of tzizit? Isn’t it clear that they are meant to remind us of the Law when our eyes and passions are being led astray? Numbers 15:39 This shall be fringes for you, and when you see it, you will remember all the commandments of the Lord to perform them, and you shall not wander after your hearts and after your eyes after which you are going astray. How can they do that when they are not visible? Second, what do we know about the style of clothing at that time? Not much but from the murals it’s best described as bathrobes. Please see Jehu in wikipedia. It has the Black Obelisk and the Jewish King Jehu which is estimated from 850 BC. There is a depiction of their clothing. Also google, ‘mural of Jews second century Syria’. Same thing, mostly bathrobes. The point is they weren’t wearing square clothing with corners. Third, years ago I used a concordance to check every use of ‘corners’. As I recall, a couple of times it’s used to mean the wings of a bird. How can ‘wings’ be construed as ‘corners’? Sure, words can have multiple meanings but in Hebrew don’t we look for a correlation? ‘Corners’ is a metaphor for each side. Firstly, the question of how could Ṣiṣiyot function if they are invisible borders on a strawman since I did not even imply they should not be visible to the wearer. Secondly, King Yehu is a terrible example to attempt proving one’s position where Ṣiṣit is concerned, since you did not notice that he and his servants are depicted in the hyper-fringed Assyrian garb which was very different from Israelite or Western Semitic apparel — probably forced to dress in it before appearing before the subjugating Assyrian king. Thirdly, the Simlah on whose corners Ṣiṣiyot were made in antiquity was not necessarily placed on the wearer such that 2 of the corners were to their rear; they may have placed 3 to the front and one on their side or rear; or 1 to the front, 2 to their side and 1 to their rear. Just because you may have seen drawings where 2 were to the rear does not mean everybody wore them like this. The word “Kanaf” can also mean in the realm of garments a corner that flaps in the wind like a wing of a bird given windy conditions. Ref that you didn’t imply that tzizit don’t need to be visible: Okay, so we agree that they need to be worn on the outside so that they can be seen, correct? You say that Israeli garb was very different than Assyrian, how so? The 2nd century murals also showed that it was mainly bathrobes or a cloak and perhaps one can infer it from this verse as well: Deut 24:13 You shall return the security to him by sunset, so that he may lie down [to sleep] in his garment, and he will bless you, and it will be counted for you as merit before the Lord, your God. Reference: 3 in the front and 1 in the rear versus 2 in the front and 2 in the rear. Not so important right now. The main thing is that the tzizit are worn with the intention that they be seen by the person wearing them, agreed? It is clear that the failure of the Karaites is a result of being disengaged with the Torah: language and exegesis. Zayin: And in the Hebrew Language in which the Torah of Elohim was given; therefore it is an obligation to learn and to study the language of the Torah and its exegesis. Karaism, today, is in dire need of New Exegetes. It should be interesting to note that in Semitic languages, the masculine is always dominant in grammatical constructions: the Sages would- or should have been- well aware of this. This is why, grammatically, even if there were the whole world of females and just one male, the masculine would be grammatically dominant. Most, nearly all, mitswoth were given in the masculine; to try to explain that one is specific to men- simply because of a grammatical clause- would men women need not heed the majority of the Torah and are held without penal liability for any infraction against any masculine dominate mitswah; it is easy to see the absurdity of this. Unless stated otherwise, or unless the grammatical context demands otherwise, any masculine dominant mitswah should be understood as genderless in practice. It is clearly understood that females are included- although all the 2nd person suffixes are in the masculine. It clearly indicated males- hence, females are not bound by this mitswah. It does not matter- directly- what the function of the tsitsiyoth were for when the argument is one of grammatical gender. An excellent piece of Dibbur Torah. Without any heavy theology you are teaching us here an aspect of Karai thought as regards grammar and about the mitvot application whether woman, men or both. This is a great way to teach the Karai Hashkafah from the ground up. If you make this a regular feature that would be great. Kol Hakovd. Chazak Chazak Vetitchazek. What if any correlation is there between the four corners of your garment and the four corners of the earth, corners of your head? 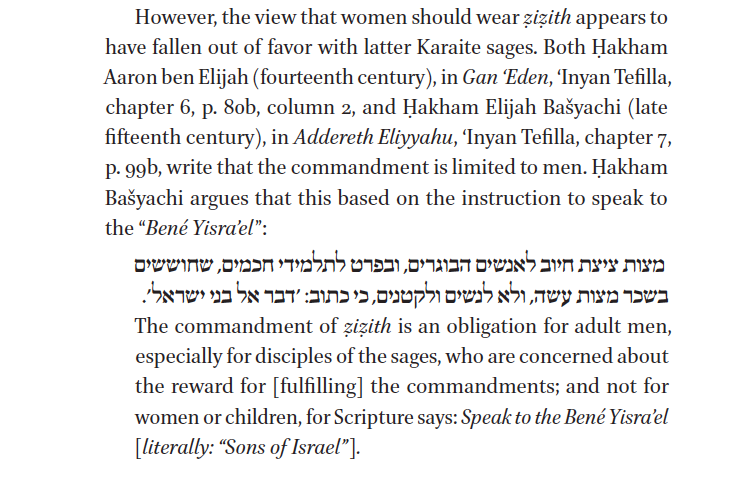 Since the purpose of tzizit is to keep our thoughts on The Commandments, it seems most appropriate that if a man looks at a woman who is wearing tzizit, he will be reminded to do so, and hopefully also see and respect her virtue.